Currently pushing around the bench a couple of 28mm figures which will need a base so today I set about that and took some WIP pictures. This is how I do it, although this is only a small base the science is the same what ever scale I work at. In my opinion never build directly onto the base you have bought or made, masking and protecting why bother. I start with a sheet of 3mm foamex (plastic card) or whatever, this way you can get as messy as you want and don't have to worry about over spill. So it begins, as this is small I'm using filler, any bigger than this then plaster of paris, why?, shrinkage, putty on big stuff shrinks and cracks. Cut your base and slapped on some putty, added a few stones for effect. Made a mistake at this point, I thought the putty would hold the stones but when I started to dry brush they started to ping off. Best solution is probably mix the stones in PVC and fix, should hold them better. Next up dry brush the rocks, I use Humbrol, have had a box full for years and never going to give them up, perfect for this job. Think of your scenario and pick the suitable colour and get busy, don't worry about over spill it really doesn't matter at this point. looks good already, by all means use stones from the garden but paint them, it's the scale effect. the texture is perfect but not always the right look. now we need to paint in the earth. 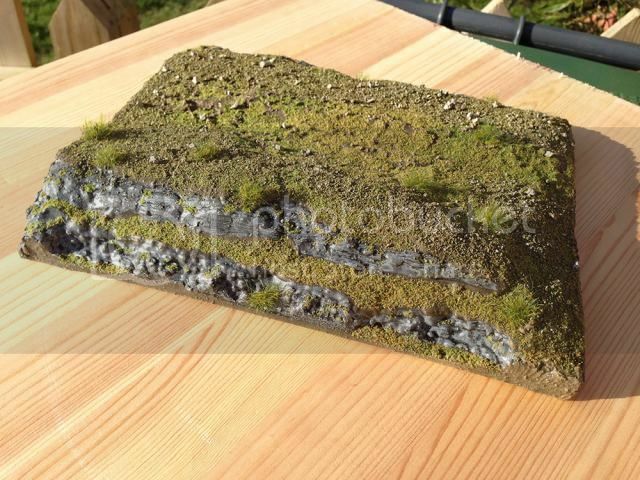 If you watch tutorials on model railways they will always say paint a light green base, vast landscaping, with this we are zoomed in so you'll see dirt. Look at a country track or meadow, its not a bowling green, use real life for reference. For this, I used dark earth, a model air colour and hand painted it, you can use an airbrush but again masking, why bother. Something new for me but think this added another layer of detail a sepia wash, never used this before but just adds another level of detail. More dry brushing, i used two shades of again humbol to get this effect, go heavy with the first and then with a lighter colour just pick the highlights. Slap a bit on the rocks for extra depth. Now this looks good but we need a bit of grass. The market is flooded with scatter products so pick whats right for you, mix up a few shades for realism it gives depth. Brush on some PVA in desired areas and scatter, blow off gently any access. In the words of my TD teacher at school, "if it looks right, it is"... But now we add a little more, longer grass around the rocks. Again another railway product but cut to length and style, you only need bits. So, that's about it, all we have to do is fix the ground work to your desired base, carpet tape will work perfectly. Simple but applied correctly works wonders. Use items from the garden but paint them, the shape is natural but not always the right look. I'm still a beginner but very critical of my own work, I'm all ears, if you have a better way then please let me know. If you have any question then ask away, if I can help I will. Would be great to see your next base and I hope this has helped. 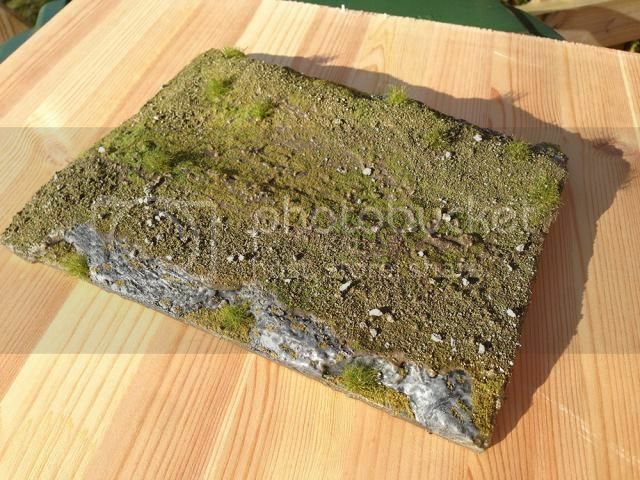 Here is a shot of it all set and dry along with another large base I have finished. If you don't have a garden, or are unwilling to go grubbing about in one, then try aquarium gravel; available from most pet shops and general stores like Wilkos, it is (relatively) cheap, clean and comes in various sizes and colours; you can even get white stones which is good for desert scenarios.